Scared of Global Warming: Go Nuke! This essay responds to a short opinion piece (which I urge readers to read before continuing) in the Guardian co-authored by scientist/political activist James Hansen and three colleagues (hereafter referred to as Hansen et al). They propose to decarbonize electrical power production by replacing all fossil fueled power plants with nuclear power plants by 2050. All four are famous climatologists and very prominent advocates of the CO2 driven catastrophic global warming hypothesis. All have advanced degrees in physics or meteorology. None appear to have a background in nuclear engineering, nuclear safety, nuclear waste management, nuclear power plant design, nuclear powerplant maintenance, quality assurance, industrial cost estimating, industrial engineering, or industrial-scale construction/project management. If executed, their conversion proposal would be the most massive industrial/economic project in human history. It would also be unprecedented in terms of required international cooperation. Why is this necessary? Hansen et al claim without proof or expertise that new reactor designs are so safe and will have so little waste that the risks are small and costs are economical (at least when compared to the catastrophic risks and costs of the climate threat). The extreme nature of their proposal does bring one of the lingering mysteries of the climate debate into sharp relief, however: namely the murky relationships among global warming, nuclear power, and antipathy to coal fueled power plants. This mystery has been lingering in the ether since Margaret Thatcher, a fan of nuclear power and a vitriolic enemy of unions — particularly the coal miners union — became the first world class politician to flack the dangers of manmade global warming caused of fossil fuel emissions. She later savagely recanted her position on global warming in a memoir written in retirement. Let’s examine the immense scale and cost of their nuclear proposal. According to the IAEA PRIS data base, there are 441 nuclear power reactors in the world actively generating electricity; 2 reactors are in long term shut down; and there are 65 new power reactors are under construction in 15 countries (almost 2/3 or which are concentrated in 4 countries: China 24, Russia 9, India 6, US 5). Worldwide, there are also 156 reactors in permanent shutdown. These numbers suggest that a world wide total of almost 600 commercial electrical power reactors have been produced since the first commercial reactor was opened for operation in England in 1956, almost 60 years ago. 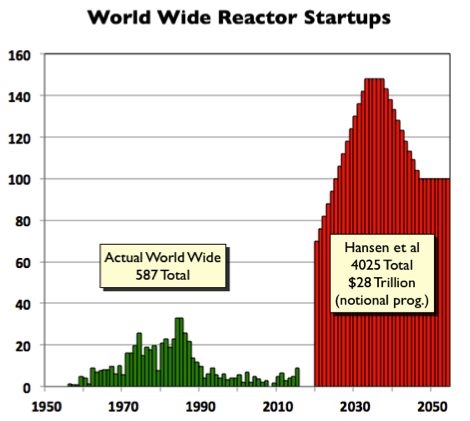 Against this level of reactor production and inventory, Hansen and his colleagues want readers to believe the “only” way to prevent the future climate catastrophe is to build 115 new reactors per year for the next 35 years. That implies a total of 4025 new commercial reactors by 2050, a number that they did not deign to mention. Nor did they say how much this program might cost or how this production would be organized. Let’s build a notional construction scenario to construct 4025 reactors in 35 years to get a feel for what Hansen et al are calling for. We can then compare the build rates in that notional program to historical construction rates. We begin by making some highly optimistic simplifying assumptions that are biased in such a way as to understate the size and cost the of the task. Construction schedule = 4 years. According to the IAEA, the average time for the 59 reactors under construction in 2012 is predicted to be 7.4 years, with at least 18 reactors having encountered “costly and multiyear” construction delays. Two projects have been in construction for 40 years. (see Figure 12 and its discussion). In the best of circumstances, assuming no schedule slippages, and using the newest designs and modular construction techniques, nuclear power advocates now claim it should take 40-48 months to build a power plant.⁠ So, for the sake of argument, lets assume optimistically that they are right and that it will take only 4 years (instead of 7+ years) to build each future reactor and there will be no construction delays during the next 35 years. Reactor cost = $7 billion per reactor. Our notional reactor will be the the Westinghouse AP1000. This is one of the most advanced reactors currently in the US and Chinese power plants that are now under construction, with possibilities elsewhere: Let’s use the cost estimate of $7 billion per reactor that were used in the original estimates for the AP1000 for reactors #3 and #4 in the Plant Vogtle project in Georgia. This unit cost is likely to be low, because we are ignoring the additional $900 million adjustment in the Vogtle estimate that was in the works as of 2012 as well as any cost increases associated with the AP1000’s ongoing construction problems in China. The $7 billion per reactor implies and optimistic estimate for a total construction cost of $28 trillion for 4024 reactors over the next 35 years. Reactor Life = 40 years. Most of today's nuclear plants which were originally designed for 30 or 40-year operating lives. We will assume the upper end. This will not effect the production program between 2016 and 2050, but reactors wear out, so we want to set up a construction profile that maintains some capacity for eventual replacement (about 100 reactors per year). Production Rates: Bear in mind our goal is simply to get a feel for what Hansen et al are proposing. What follows is illustrative construction schedule and is in no way realistic, in that it optimistically assumes no waste, fraud, or abuse in what would be a gigantic surge of construction activity. We will assume construction starts in 2016 by initiating the construction of 70 new reactors (in effect immediately doubling the worldwide total of 65 are in various stages of construction). Production then builds up rapidly to a maximum of 148 new starts per year, holds steady for 4 years, then declines to a steady state of 100 starts per year until 2050. Given the preceding assumption, this schedule would bring 4025 reactors on line by 2054 and maintain capacity to begin replacing reactors scheduled for retirement. The first tranche would come on line in 2020 and the last tranche would come on line in 2054 (four years after the deadline set by Hansen et al). Figure 1 compares the rate of reactor start ups under this notional program to the worldwide rate of startups between 1956 to 2015. It speaks for itself. Remember, this program is not realistic — but it matches the numbers in Hansen et al; and that brings me to the point: Any notional scenario that matches their numbers will create the same pie in the sky impression. Hansen et al justify this immense buildup of nuc power stations by claiming the risks posed by these nucs are small relative to the catastrophic risk of climate change. So, let’s consider the balance of risks posed by the uncertainties implicit in this portrayal. When one begins to relax the planning assumptions in the name of realism, unit costs will increase, as will total program cost, schedules will stretch out, the reactor buildup (the red bars) will shift to the right, and the age of the existing inventory of reactors will increase. The theoretical date of decarbonization would be pushed ever further into the future, bringing into question the whole rationale for the crash program. While Hansen et al claim this kind of crash program is needed to prevent a hypothesized climate catastrophe, there is obviously a lot of risk for real human and material screw ups in building and operating so many nuclear power reactors so quickly. They ignored these risks in their oped, but it behooves one to think about them. Commercial nuclear power has an impressive safety record, with only two major catastrophes in 50 years out of the 600 reactors built to date: one light water graphite modulated reactor (considered by many experts to be a dangerous design) exploded at Chernobyl, and several more modern light water reactors at the Fukushima plant were seriously damaged by the effects of a major earthquake. Both accidents resulted in terrifying radiation leakages. While the causes of these catastrophes were very different, each had horrifying environmental and human consequences. The full extent of these consequences will not be known for generations, given the nature of radiation damage to organic tissue and DNA. The worst incident is US history was the partial meltdown at Three Mile Island, fortunately contained. Note how Figure 1 shows that actual world wide nuclear power plant construction slowed to a crawl. That slow down was caused in part because of the quite reasonable fears raised by these incidents. But there is more to the slow down. Construction of new reactors has also been slowed by recurring safety issues in existing reactors, including (1) the intractable technical and political problems of radioactive waste disposal; (2) reactor management and operational issues related to poor quality control, deficient inspection and safety procedures, and questionable compliance reporting; and (3) the effects of aging of existing reactors and supporting equipment. Yet the primary reasons construction of additional new Reactors in the United States stopped between 1978 and 2009 were related to the huge cost-increases and substantial schedule slippages in construction — i.e. due to management fiascos including poor planning and financing. Because of these fiascos, the taxpayers were made to foot bill on many of these projects. Given this management history, coupled with the current neo-liberal business culture’s obsessive focus on short-term goals and profits, the high up-front costs for a new reactor exceeds the loan borrowing capacity of most utilities. Therefore, in the US, investors demand that the government subsidize loans with federal guarantees. How such guarantees will be arranged around the world is yet another subject Hansen et al deigned not to address. But if past is prologue, the real cost of the world wide program in Figure 1 would be well in excess of $28 trillion and investors will demand guarantees that will ultimately be paid for by consumers. There is yet another obvious if subtle risk factor that was totally ignored by Hansen et al: It must be assumed that the dramatic slow down in recent construction has been accompanied by a decrease in skilled nuclear operator labor, as well as engineering and hands-on nuclear program management expertise. That consideration raises a question how safe and feasible it would be to rapidly expand to a crash program that multiplies total reactor production by a factor of 6.7 in only 70 percent of the time it took to produce all reactors in the world to date. Perhaps the biggest weakness in Hansen et al, however, is logical. The case for decarbonization of power production has always rested on what environmentalists call the precautionary principle. This is not a scientific principle but rather an argumentative proposition designed to justify a course of action. It does so by purporting to account for uncertain future risks associated with problems posed by damage to a “commons.” Garett Hardin brilliantly analyzed the difficulties of coping with this kind of problem in a seminal 1968 paper entitled The Tragedy of the Commons (ironically, his subject was the risk of nuclear war and morality). The precautionary “principle” in its current incarnation argues that if an action or policy has a suspected risk of being dangerous to the public or to the environment, and there is no scientific consensus that the action or policy is not dangerous, then the burden of proof that it is not dangerous falls on those taking an action. The conjugation of “suspected” and “not” in this construction means that the person charged with the burden of proof must prove a negative — which is impossible. The precautionary principle makes for a powerful emotional argument, particularly combined with an exaggerated sense of fear, because it turns the scientific principles of falsifiability and conditional truth on their heads.⁠ Moreover, invoking the Precautionary Principle places no logical limits on the upper bound for the cost of an ‘ounce of prevention.’ Anyone who doubts the power of this argument should examine how successfully the Pentagon uses the precautionary principle (in the form of inflating future threats) to jack up its budget⁠. But even if one accepts the precautionary principle in this case, one must admit that it must also apply to nuclear power. Hansen and his colleagues are claiming that the theoretical and unprovable danger posed by CO2 [see endnote 1] is more dangerous than the dangers implicit in an unprecedented expansion of nuclear power. The proof that nuclear power is both costly and very dangerous is far more obvious and far more empirical than any theoretical future dangers posed by global warming: Chernobyl and Fukushima, not to mention the lesser dangers in Rocky Flats, Hanford, etc. are proof of nuclear power’s clear and present danger. Yet against the social and economic costs of this known danger, Hansen et al would have the reader believe that the cost of a hypothesized catastrophic danger in the future is greater than the known danger. So while Hansen et al's CO2 argument is based on the precautionary principle, the clear and present danger inherent in their proposal to unleash an unprecedented crash program in nuclear power plant construction makes a mockery of the very principle they rest their case on. And that, dear reader, is a logical absurdity. See Professor John Christie’s statement and Professor Judith Curry’s statement to Congress for succinct statements of the some of the problems of these computer models. The short video of Professor Freeman Dyson’s fascinating critique is also useful for people trying to understand the modeling problem (about 9 minutes into the video) as well as larger issues surrounding the alleged dangers posed by carbon dioxide. All of these critics agree with the physics of CO2 being a greenhouse gas. Currently, the cost of nuclear power — particularly the capital cost — would be prohibitive without substantial government subsidies (in the form of long term government loan guarantees). Even if one believes the very unreliable and typically optimistic cost life cycle cost estimates for nuclear power, on average, life cycle costs would as much a 2.6 times coal (w/o co2 scrubbing), 1.05 times coal (with scrubbing that removes up to 90% of the CO2), and 1.6 times natural gas, in $/MW-hr. Each plant usually has between 1 and 3 reactors. The US, for example has 61 plants with 99 reactors. Japan is home to the world’s largest nuclear power plant with 7 reactors. This video clip from one physicist Richard Feyman’s famed Messenger Lectures is a brilliantly simple and humorous explanation of the scientific principles of falsifiability and conditional truth. The inmates of Pentagon routinely invoke the precautionary principle plus the politics fear to jack up defense budgets — but it goes by a more straightforward term: Threat Inflation (e.g., the Bomber Gap, the Missile Gap, and the Window of Vulnerability during the Cold War. While circumstances of the recent shoot-down of the Russian SU-24 by a Turkish F-16 in the border region of Turkey and Syria remain murky, Andrew Cockburn’s interview of Pierre Sprey, attached below, is best analysis that I have seen to date. Be warned, however: I am biased, both the interviewer and the interviewee are good friends of mine. This compound map may help you to follow their discussion. 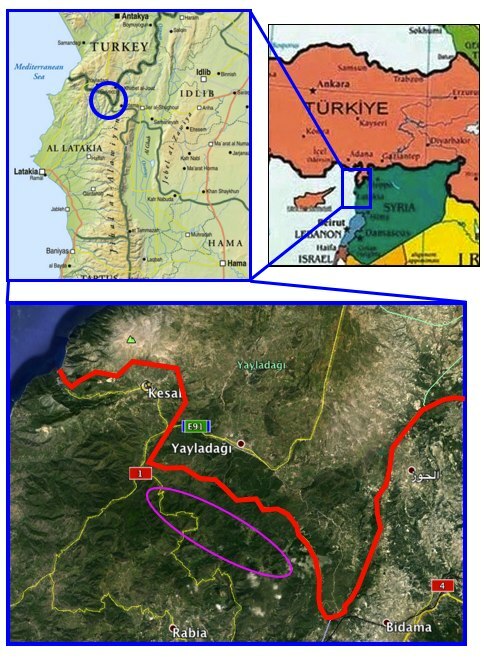 The shoot-down took place in the vicinity of the southern-most point of Turkey’s Hatay Province, a province with a history contested between Turkey and Syria ever since the demise of the Ottoman Empire. (When I visited the port captain’s office at Latakia harbor Syria (in 2008), the map behind his desk designated Hatay as “Occupied Syria.”) The Russian SU-24 crashed into Syria and the one surviving pilot landed in Syria in the area just to west of the southernmost point of Hatay, probably in the area enclosed by the blue circle on the compound map below. The target area was about five miles south of Yayladagi, probably somewhere inside the magenta oval in this Google Earth satellite photo of the border area. The red line is the Turko-Syrian border. This corner of Hatay province is rugged, forested mountains with few roads (the yellow lines), and it is likely that infiltration routes for refugees into Turkey and jihadis out of Turkey are narrow foot paths through the mountains. If Sprey’s analysis is correct, the pilot could easily stray briefly across the southernmost tip of the Turkish border on his high altitude (~ 18,000 ft) flight path from the east or south east, and if hit, the pilot would likely land in Syria since his target area was well south of the Turkish border. This border geometry should help the reader appreciate Sprey’s hypothesis with respect to careful timing and a prepared ambush. One factor not addressed in most media reports is that the Russian airplanes were sitting ducks for the Turkish F-16s waiting in ambush with IR missiles. The SU-24 Fencer is a large, lumbering 40 ton, late-sixties Soviet knockoff of our infamously un-maneuverable F-111 Aardvark. I urge readers read carefully the entire interview at the link indicated below. I asked Pierre Sprey, a longtime defense analyst and member of the team that developed the F-16, to examine what we know about the downing and determine what actually occurred that morning. The Russians have claimed the November 24 downing of their bomber was a deliberate pre-planned ambush by the Turks. Is there any merit in that argument?